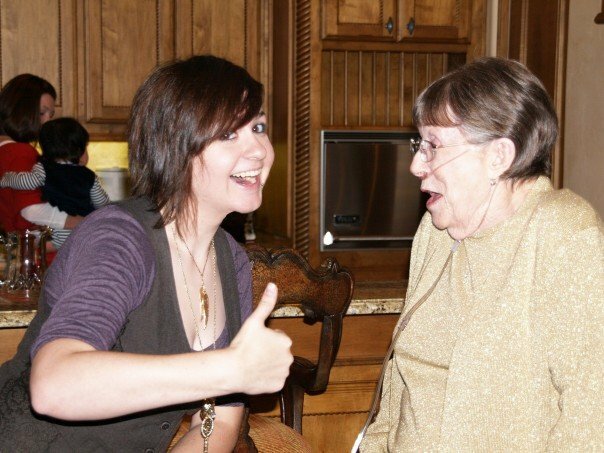 This is probably one of my favorite pictures, mainly because it is just a silly picture with my Nana (my dads mom). She past away last year and this was one of the last times she was well enough to come out to a family outing. Nana was a no nonsense tell you like it was regardless of whether or not it would hurt your feelings kind of lady. I very luckily was one of her favorites so was only on the receiving end of her speaking her mind only once or twice. My mom on the other hand was on that end quite often, and as you probably guessed they weren't the best of friends. I remember growing up and thinking it was so silly why mom didn't get a long with her, because I thought she was the coolest. But the last couple of years of her life she made a real effort to stop speaking her mind if she knew it wasn't the nicest thing, and if she did still say it she made sure to apologize later on. I think my mom and that Nana would have gotten a long much better. I still have the last couple of voicemails she left me saved on my phone and will listen to them every couple of months. I am so happy for all the time I got to spend with her, she was one wonderful lady. This picture is just so cute!